As someone who loves film, it’s dismaying to find such an uneven range of films about disabled people. There are the treacly, Oscar-bait films that follow every inspirational trope and played by non-disabled people. Some of those films in the inspirational category are patently ableist and send dangerous messages about disability *cough, Me Before You, cough. * There are the mediocre ones that may be ‘about’ disability’ and created by disabled people that are just *meh. * And then every once in a while there are awesome films that “get” disability culture with nuance and complexity like this year’s Finding Dory by Pixar. Celebrating their 30th anniversary, Superfest is the world’s longest running disability film festival, celebrates disability as a creative force in cinema and culture. Presented by the Paul K. Longmore Institute on Disability and the LightHouse for the Blind and Visually Impaired, the festival will take place on October 22nd in Berkeley and October 23rd in San Francisco. 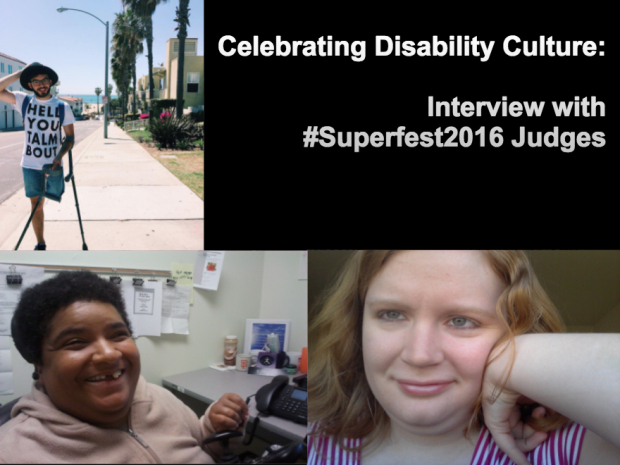 I had the pleasure of interviewing three judges for Superfest 2016: Elizabeth Grigsby, Alex Locust, and Katie Murphy.... Thank you to Elizabeth, Alex, and Katie for participating and thank you to Emily Smith Beitiks, Associate Director of the Longmore Institute for connecting us! Elizabeth: I’ve been an advocate pretty much for myself for a very long time. I don’t believe in taking no for an answer. I believe just because you have a disability, it doesn’t mean you can’t have the life the way you want it. Your disability shouldn’t define you because we are not our disability. I became involved in Superfest because of Emily Smith [Beitiks]. I believe in the mission of people with disabilities telling their stories of letting people know how fabulous we are and how we need to be listened to and heard. Katie: I recently graduated from San Francisco State University with an MA in Women and Gender Studies. During my time as a student, I worked an on-campus non-profit, the Longmore Institute on Disability which co-organizes Superfest with the Lighthouse for the Blind and Visually Impaired. One of my first assignments for that position was to vet a list of possible community supporters for that year’s festival. I went on to do a lot of work to prepare for the 2014 festival and the 2015 judging. In addition to bringing me into the Superfest fold, my position at the Longmore Institute really enhance my academic work as a disability studies scholar and activism as autistic self-advocate. Alex: I am a graduate student at San Francisco State University earning my master’s degree in Clinical Rehabilitation and Mental Health Counseling. I moved to San Francisco to pursue this degree and have been in awe of the breadth of opportunities available in the Bay Area to immerse myself in the disability community. On campus I am the president of the Rehabilitation Counseling Students Association, a student organization dedicated to infusing disability awareness into campus culture and our local community…I had volunteered for Superfest last year and absolutely loved the festival so I was over the moon when I heard about the chance to become involved this year as a judge. Is this your first year of judging? Tell me about your experiences judging this year. If you judged films for several years, tell me how your experiences changed over time. Alex: Overall judging for Superfest was that rare form of holy grail experiences in life. Screening all of the films taught me a great deal about my own ideas around disability, both in reinforcing positive values I hold and by shining a light on biases and assumptions that I need to work on. At the end I felt so invigorated and energized knowing I was fortunate enough to have been a part of this experience…I am excited to see this films showcased at Superfest because I hope that their success will encourage other disabled artists to pursue creating pieces without the pressure of big budget or mainstream backing. Katie: This is my first year serving as a judge, but I did attend last year’s judging weekend as part of my job with the Longmore Institute. That was where I first discovered I have a knack for doing live audio-description – basically, describing the action on the screen for the blind members of the panel. I did that again this year. The big difference between last year and this year is that I felt a lot freer making my opinions known during discussion because I was officially a judge. Katie: Getting to see films that I wouldn’t otherwise have the opportunity to view. Elizabeth: The most fun experience was getting to know everyone and actually getting to see the films. Alex: Every week I got to escape to an alternate reality at the Institute where were immersed in narratives around disability and engaged in critical discussions about them. Seeing so many portrayals of disability made it abundantly clear that these films can and should be happening outside of our Bay Area bubble…Not only did I love getting to see all these films, but also the community element of judging was probably my fondest memory of the process…Whether we completely agreed or were in utter opposition, we always had a good time and I need more spaces in my life where I can hang out and make genuine connections with other disabled people. Elizabeth: The most challenging was deciding which films to pick and which ones to get rid of. Alex: …it’s much easier to say how something makes you feel rather than why, which is the meat of what we discussed during judging…The diversity of experiences of the panel added so much depth to the conversations about the films and are something that I rarely experience in my day to day life. Because the judges retreat allowed for more time to discuss the films, I noticed a much heavier emphasis on the film making process, which is important. I feel more confident about showcasing the films with the insight of experienced filmmakers weighing in on the submissions. After screening 100+ films I found myself becoming fond of some films over others (I’m only human) and it was great to have a team of peers to challenge me in those moments. At the end of the screening process we were all struggling to make those final cuts. What should be a conversation of “does this film do a better job of embodying our mission than others?” at times also felt like something to the effect of “is this film about blindness better than this film about deafness?”…Thankfully I am confident that with Emily Beitiks’ guidance and our collective feedback we have selected the best films for the festival, despite the challenges we faced along the way. Katie: Communication and coming to a decision as a panel…for a festival like Superfest, judges have differing opinions that go beyond the technical or artistic quality of the film. We all have different lived experiences of disability; we all belong to different communities. This shapes our understanding of what counts as a good portrayal of disability. The challenging part is respecting everyone’s opinions as results of lived experience – while still advocating for the films you think are the best. Do you have a particular favorite or standout film that you feel strongly about? If there’s one film someone should see at Superfest this year? Katie: My personal favorite would have to be Supersonic, a superhero film from the British Sign Language Broadcasting Trust. It’s an origin story/coming of age tale about a black, Deaf teenage boy as he struggles to reconnect with his father. The film deals with racism, city life, the power of stories, and Deaf family life. I wrote my Masters thesis about disabled masculinities in speculative fiction, so Supersonic was right up my alley. There’s a lot of symbolic imagery in the film, so it was really fun to audio describe as well. Overall, the film has a lot of heart and emotional depth while still featuring all the triumphant superhero fun you’d expect from a summer blockbuster. Alex: …I will say that “Awake” effortlessly accomplishes every criteria we were screening for during judging. I was enamored with how many elements of the characters disabilities were highlighted in such a short film and in a delicate way that wasn’t forceful or blunt. The film showcases their skills as independent, blind women in such a finessed way that it both is subtle and unspoken while simultaneously being the focus of the narrative. The characters are engaging, charming, and complex; the acting is high caliber; it features disabled actors in disabled roles; and best of all the film left me feeling the warm and fuzzies without being too cloyingly sweet. It plants a seed to reflect on and is the kind of short film I would love people to cite as high quality work done by and for people with disabilities. Elizabeth: The film that I liked the most was the one about Patty when she described her experience on BART when she was looking across to that guy. 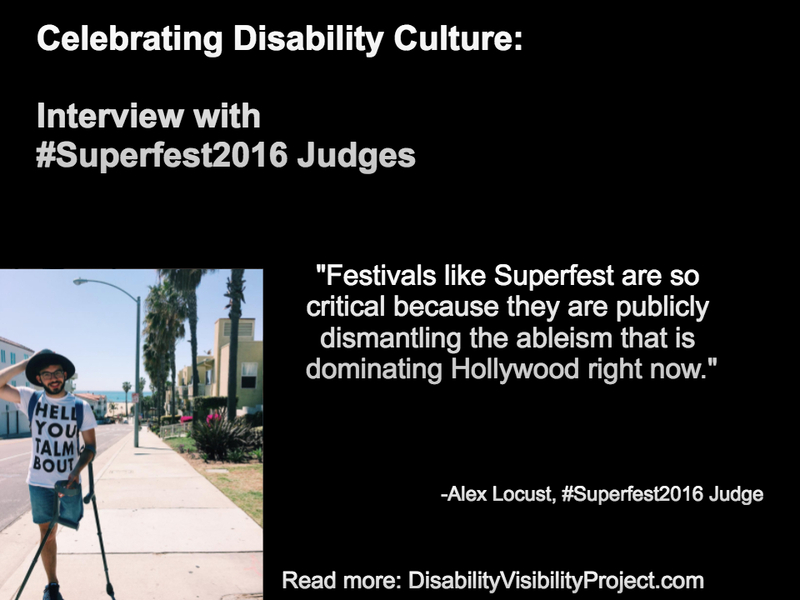 Alex: Festivals like Superfest are so critical because they are publicly dismantling the ableism that is dominating Hollywood right now…Superfest is undoing all of these negative assumptions and then some. “Disabled actors can’t act.” Clearly they can. “Making films isn’t an accessible process.” Obviously these filmmakers have had success…Lastly, the measures that the coordinators take to make the festival accessible set the bar as a shining example of how to make a festival inclusive to an audience of varied disabilities. Elizabeth: …Superfest is important to let non-disabled people know that even though you have a disability, you can have a good quality of life just like everyone else. Katie: Superfest is uniquely important due to its embeddedness within the disability community, specifically the Bay Area disability community…There’s a real sense of community ownership tied to the festival, which gives everyone involved the privilege of inviting filmmakers from across the country and the globe into our community. On the other side of the coin, the sense of community also empowers our audience to speak up when the festival strays from their expectations. Elizabeth: They need to have real people with disabilities act in movies instead of getting people without disabilities to play the part like the movie “My Left Foot” starring Daniel Day Lewis. I think it should have been a real actor with a disability. Even though I like Daniel Day Lewis, it takes away the authenticity. Katie: In my mind, the underrepresentation of disabled people in filmmaking comes about in two ways: exclusion and erasure. Exclusion is probably the most widely talked about: disabled actors and creators are not being hired or even given the chance to hone their crafts at the amateur level. Due to systemic ableism, there are about a million factors preventing the full participation of disabled people in cinema…everything that makes life harder for disabled people also makes success in the film industry harder as well. This is not a result of biology, but rather systemic ableism. The other issue is erasure, specifically the erasure of disabled people from the film industry. Disabled people have been present in filmmaking since the very beginning. Literally, the very beginning: the inventor of the motion picture, Thomas Edison, was deaf. Some of the most iconic Hollywood figures had disabilities: Marilyn Monroe, Howard Hughes, Judy Garland, Sammy Davis, Jr., to name a few. But when we talk about the underrepresentation of disabled people in film, their names rarely come up. Why is that? Well, one, I think society as a whole does good job of covering up any evidence that disabled people have played integral roles in various communities and industries throughout history. It’s a lot easier to justify exclusion if you can say, “No one’s ever done this before so it can’t be done.” To improve representation of disabled people in filmmaking, we have to fight exclusion and erasure – within the mainstream and our own communities. Alex: I’m not interested in seeing any more films that are “getting disability on the big screen” with able bodied actors who have “done their research” for disabled roles. If we continue to analyze these movies for their “redeeming qualities” around disability themes, we are perpetuating a cycle that condones this behavior and sends a message to future filmmakers that substantive disability themes will excuse poor casting efforts. While I do want to see disability represented in the media, I think that it will be more powerful to see doors opening for disabled filmmakers rather than these narratives shared in such problematic ways that continue shutting out the people who can tell the story best. People with disabilities are facing the same frustrations that other marginalized filmmakers (people of color, LGBTQ+ people, etc.) are experiencing and I find it fascinating that the parallels between these communities aren’t made more often. I believe that as long as disability is viewed as “taboo” or “other than”, we will continue to see portrayals of disability in media that is digestible, not challenging; trite, not complex. Why is disability as a diversity an important issue to emphasize with Hollywood and mainstream media? Alex: Representing disability is obviously complicated and complex, but if Hollywood is looking for fresh, novel stories to tell, disability is a gold mine of untouched treasures if treated properly. It’s unexplored territory, essentially and in the age of intersectionality, I know there are countless people out there that would rather see a movie about a queer, woman of color with a disability living life than trudge through another film about a cisgender, heterosexual, able bodied, white male meandering his way through a midlife crisis. Being privileged is hard and full of ennui, we get it. Time to move on. Katie: What’s great about Superfest is that it provides a space for disabled artists to create work on disability and not have to worry about what non-disabled people think about it. Those filmmakers are able to emphasize disability as a dynamic social and bodily experience whereas Hollywood and the mainstream media tend to emphasize simplistic, stereotypical assumptions of what disability is and can be. Alex Locust is a graduate student, disability advocate, pun lover, shine theory enthusiast, dancing queen, and budding public speaker. Currently, he is the President of the Rehabilitation Counseling Students Association at San Francisco State University, a student organization dedicated to infusing disability awareness into campus culture and our local community. He is also the recipient of this year’s Graduate Student of the Year Award at the National Council on Rehabilitation Education spring conference. Outside of his courses and clinical internship he is working as a student assistant at the Paul K. Longmore Institute on Disability. Katie Murphy is a self-advocate, disability studies scholar, and freelance audio-describer. Her hobbies include repetitive movement, poor eye contact, and intense interest in esoteric subjects.